Costa Rica has been a blessing to all 51 people on the mission trip. Words really can not describe how lives have been changed, both for the Costa Ricans and those on the mission trip. The stories people have heard and shared move us. Here is a short video giving a glimpse of what we did in vacation bible school. As I sit and recall everything that happened on Wednesday, my heart aches, yet is hope-filled. The day began with 30 extra minutes of sleep, which was great, and a quick breakfastbecause my son has felt so at home that he left his only pair of tennis shoes in another family's room. Needless to say, we looked and looked until it was found. Our day got off to an unexpected start. Devotion was great, as always. We talked about kindness, a fruit of the Spirit, something so simple that seems to be often overlooked. There is something special about this group of people who gave up time, money, security, and comfort to come to a country and a people to be the hands and feet of Christ. My family and I are just overwhelmed by the opportunity to serve with everyone on our team. On Wednesday we boarded the buses and headed through the broken, yet beautiful streets and communities of this amazing country. It's broken because of the living conditions of many Costa Ricans, but beautiful because of the wonderful imagebearers of God who live here. We snapped pictures in amazement as we passed homes and businesses, but with much excitement because we knew we had another opportunity to love a child, a mother, a father, a people. We love Costa Ricans! On this day, Gabriel, myself, and the boys were on the food distribution team, which entailed going into the homes of a few families in Los Guidos. We delivered food, prayed with families, and just showed love as the presence of God went before us. You see, driving along the streets and seeing the dipravity was one thing, but being in the homes of each family was something all together different. My heart was touched many times over. I would do this trip all over againif I could. The people of Costa Rica are people just like us, who need hope and the Savior just like us. In those moments, as we stood in their homes, we were all one, we are all one. We felt the same things, cried together, prayed together and showed genuine love towards each other. VBS was a success, although it wasn't just because we did our best, but alsobecause of the lessons the kids learned, the smiles on their faces, the hands that were held, the hugs that were given and the love of Christ that was shown. VBS is always life changing with our Mountaintop family whetherwe're in Birmingham or Costa Rica. I have been reminded during this trip that even in places that seem dark and broken, including those places in ourhearts, God can still use one or many people to be lights of hope, and hands and feet of love. We will be forever changed by Costa Rica, and the amazing people who live here. When thinking about this blog and our time here in Costa Rica, my thoughts started to go back to what we learned at Mountaintopin our "Be Rich" series. As I started out on this journey, I didn't know what to expect in terms of how I would be impacted from my expereince. My initial thoughts were to think about how this trip would impact my kids and our family as a whole, but not me individually. I thought about the lives we were going to be ministering to, and how God would use our group to share His message of hope and love. 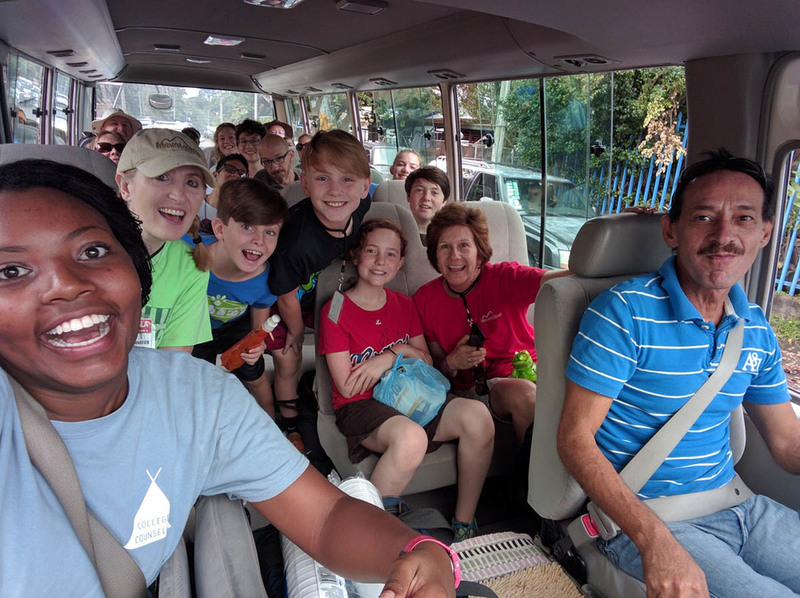 For me, it was easy to look externally for ways I thought this mission trip would impact those around me, and I thought very little about how I would personally be impacted by the experiences I'd encounter. Being a part of this trip has afforded me the opportunity to see just how truly "Rich" I am as a father, husband, and man to be alive during this time. I believe in the sovereignty of God, and I know that he chose me and my family, very strategically, to be a part of this trip for a specific purpose. You see, I was going into this trip thinking about how much we as a family were going to be able to give to the families we came in contact with; but I believe God opened my eyes to see that I too have been given so much. The funny thing was that I didn't start immediately thinking about the material things I had such as money, cars, homes and natural possessions. Instead, I started to think about having a family that's in good health, loves the Lord, and have a passion to help others. It hit me the most when we were going into the homes of some of the locals, giving them food and praying with and for their families. In the very first home as soon as they asked for someone to pray for their family's needs, my youngest son Christian stepped up to the plate and said a prayer without being prompted and having no fear. Here he was, the youngest kid on the trip and we actually were debating about whether he was too young to be here, and he was the first person to pray for a family in need as we stood in their living room trying to hold back tears from the testimony they shared. That was a powerful moment for me because it allowed me to know that God has truly smiled on my family and more specifically me. In that moment I knew without a shadow of a doubt that I was rich beyond my wildest imaginations, and that was the thing God wanted me to share with the families that we would encounter. They didn't care about my socioeconomic status or what I was wearing, all they wanted was to feel loved and experience Christ in a very tangible way; and because I've been blessed with the love of Christ and the love of family, that is something I can share with others. Showing love would go beyond any cultural, language, or social economic barriers that would present obstacles that could cause me to be hesitant about sharing Christ. So this has been my experience thus far, and I'm sure the others in our group have been able to feel the same love, because the unity among this group of 51 kids and adults has been nothing shy of amazing. It has been so refreshing to worship with another culture to see Christ being glorified in another part of the world because it gives a visible picture of the magnificence of God and how all nations will bow before Him one day. So I'm excited for these last few days, and I look forward to continuing the work of getting off the mountain in the days to come! Today was a GREAT day. We started off doing lawn work and VBS prep. Some of our team went door to door and delivered groceries and prayer to the families. After lunch, a lot of our team went out to invite more people in the neighborhood again while others like myself stayed and awaited for our guests shouting BIENVENIDOS (welcome) as they came walking to the gate. There were 40+ more children/teens/mom's that came to our VBS today than yesterday. Today I stayed with the mothers. They are so great. We had them serve themselves to coffee and cakes, and sit in a circle. The mothers and teens both got prayer journals as their craft today. LaDonna encouraged the mothers to write their prayers down and look back at them to see how God answered them. 3 team members shared their testimonies. One to the mom group, teen girls and teen boys. The mothers were receiving the testimony shared to them very well and gave hugs after to show their appreciation. Chyanna boldly shared her testimony to the teen girls, then two Costa Rican girls decided to share theirs as well!! Isn't that amazing? And some of the teen boys look tough and too cool on the exterior, but were so happy to be back and received some of the bible verses I had with smiles and "gracias" (thank you). Tonight, we debriefed and heard Salvador's amazing testimony with watery eyes (I speak for myself). God is doing some amazing things in Los Guido. Please pray for this country, city of Los Guido, and hearts of people that we and SCORE come in contact with. Veronica and Salvador need the prayers and strength from God to keep the community thriving in the riches that is God's love for us. I learned today that this is the first VBS they have had... so praise God for all of you who have supported in some way. We love you all! Gearing up for our last day of VBS and some sad goodbyes, but many hugs. Hey everybody! Have you ever been done to Costa Rica? Well, 50 Mountaintoppers and I are here right now! Today is only our second day, and we are having tons of fun! On day 1 (yesterday) we started off by meeting at the church and celebrating my 15th birthday with donuts at 2:00 AM. From there we made great time to the Atlanta airport, where we boarded the plane and took off to Costa Rica. It was almost a four hour flight, but it wasn’t too bad. After we landed we meet Verónica, Salvador, Josué, and Sofía Barrante. The SCORE villa is in Guadalupe, Costa Rica; which is about 45 minutes away from the school we are working at. After a good night sleep we start day 2! In the morning we started with a devotion about peace and then divide up into two groups to go food bag shopping. Through out the morning we started to prepare and make posters for VBS. In the afternoon went to the school we are using in the town of Los Guido. We played some soccer and visited and prayed over the areas we are using for VBS. After we came back to our Costa Rican home and had an amazing dinner, while we talked and prayed about tomorrow. We are all very excited to see how God will use us these next few days!!! Be sure to check out the video to get a glimpse of our days, and to follow our instagram account @mtopcostarica to see more pictures. Keep checking in for more updates!